10/06/2012: What Does God Need to Complete the Work? / Brazil / 10/06/2012: What Does God Need to Complete the Work? What Does God Need to Complete the Work? Before becoming a missionary, I had a deep impression that God wanted me to perform a great work in His cause. I had the opportunity to be a Bible worker with a ministry in Sao Paulo; I preached in Adventist and Evangelical churches, participated in radio programs, made a few mission trips inside and outside of the country, worked as a supervisor of missions and Bible teacher at Taquara Institute (the school from which I graduated). Although I was sure I was doing God’s will, I still felt a strong desire to achieve something more in the state that I came from. This was a great challenge, because there were many obstacles, including the following: the area seemed dead; I was not associated with an institution that would publicize my evangelistic events; there was no money for a radio program; the Adventist church in Brazil would not hire me for something big, because it was just my wife and I. Just when I felt overwhelmed by the unfavorable circumstances, I made a special petition to the Master, that He would guide me in what He wanted me to do for Him. “The greatest victories gained for the cause of God are not the result of labored argument, ample facilities, wide influence, or abundance of means; they are gained in the audience chamber with God, when with earnest, agonizing faith men lay hold upon the mighty arm of power.” Gospel Workers, 259. Priscila giving a Bible study to the women. I came to the conclusion that I would not travel on any more foreign mission trips, but rather I would center my efforts in my very own neighborhood. Then God sent a worker to join us in this work. Through the reading of the book Evangelism, I understood that God was calling me to work as a minister. Preachers enjoy preaching to large crowds, doing large evangelistic campaigns, giving calls with a large response, seeing lots of results from their labors. That is very rewarding. When you find yourself just knocking on doors, that are often shut in your face, you wish you could be working in a more rewarding environment, but we are told, “Of equal importance to public lectures is the homework at home in the homes of the people.” Evangelism, 429. From these words, I took courage in the work that I was doing. We started knocking on people’s doors, and I began to realize that I really identified with their needs. I began to understand more deeply why Christ spent more time in His ministry healing than preaching. The gateway to the truth is the message of health. We were able to get many people interested in changing their bad habits as an entering wedge. My wife offered vegetarian cooking lessons right in their homes. The number of people that chose to become vegetarians started growing, and then the number of people who wanted Bible studies began increasing, too. One day I was introduced to Mrs. Maria by a friend, John, a dedicated worker from Taquara Institute, who was canvassing Adventist books in the area. John had developed a friendship with Mrs. Maria and had begun Bible studies with her, but as he needed to move on to another area, he asked me to take over the Bible studies. I soon learned that Maria has a son who was a former drug user and was admitted to a rehabilitation center for drug addicts. John had gone to the center with Mrs. Maria to visit her son and had the opportunity to talk with the administrators of the place. On first contact with them, John told them where he was from and mentioned about the work of Taquara Institute. 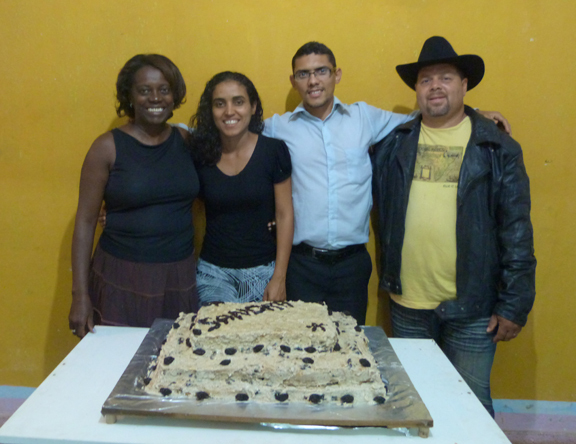 Clayton and his wife Priscila with the administrator and his wife. Later, when John returned for a second visit with Mrs. Maria, the administrator (a pastor) told John that he was having liver trouble. John invited him to Taquara for some natural treatments. The man and his wife went there that very week. Dr. Andreia told him that he would need to make radical and immediate changes to his eating habits. The doctor also oversaw treatment for him all that week and put him on a raw food diet. During that week, the man saw great improvement to his health. Days later this man called Dr. Andreia to ask for some advice. The doctor told him of a young couple who taught people how to cook vegetarian meals and gave him our contact information. When he contacted us, we learned that we would have to drive fifty miles to give the man and his wife vegetarian classes, but we were willing. We went and gave cooking classes to the whole rehabilitation facility. The rehab center had the men and women segregated. 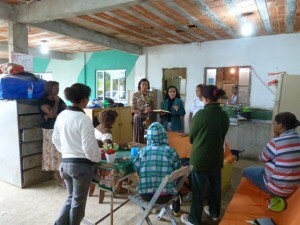 So we did cooking demonstrations for the men one day a week and taught cooking to the women a different day each week. I desperately wanted to teach these people the truth. I thought how many souls would be won to the truth, if only I could teach it to them. The men at the rehab center. I had to learn in practice that only the methods of Christ bring success in the science of soul winning. Instead of opening the Bible and talking about the righteousness of Christ, the state of the dead or the Sabbath, there I was, every week, cutting onions, kneading dough and talking about physical food. The need of the family at that time was losing weight and being healthy, so we had to meet their needs. 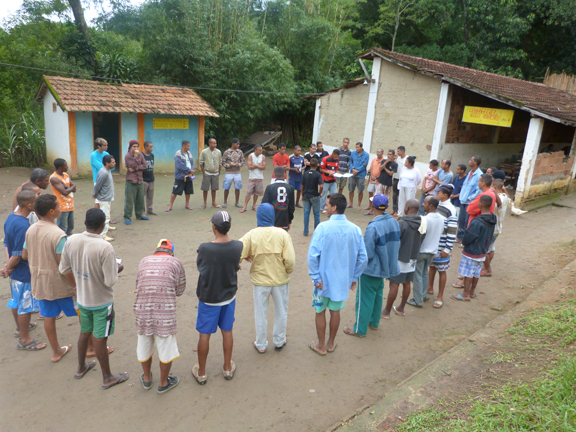 We developed a beautiful friendship with the residents and also began to gain the confidence of the administrators/pastors. After some time of doing this with them, I realized that we were traveling a long way twice a week teaching the same demonstrations to the same people, because only the pastor and his wife were now attending the course. Then I called the pastor and explained the situation to him, that I did not want to make this trip twice a week unless there were many more people attending. I said we needed to have a group of over fifty. I asked that he come up with some activity that would attract all of the people. 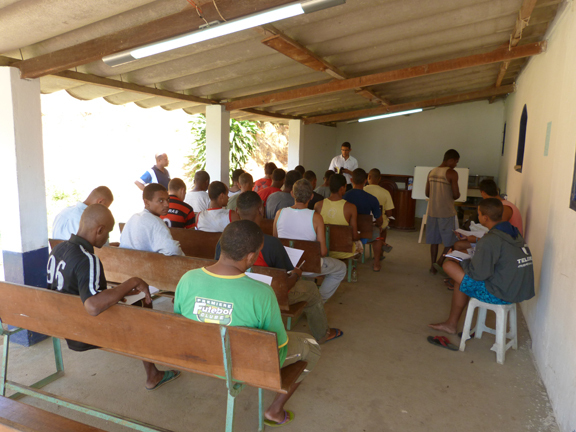 Men eagerly listening to the Word of God. That day I saw that what God really needs to do His work in a heart that is ready and willing to honor Him and sacrifice for His good. By the grace of God today we are studying the truth with more than sixty people from the rehabilitation center, and we continue to gain the confidence of those Sunday-keeping pastors. The influence of our work has spread beyond our neighborhood, but is still in our state. The pastor has improved health and many people are now listening to the last warning message. Through prayer, the methods of Christ and a willing heart, God can do for us more than we think or imagine. Amen! By Clayton Silva, First Fruits Ministry Missionary, Rio de Janeiro, Brazil. Email: clayton.1978@hotmail.com. Clayton’s ministry in his home state of Brazil is this quarter’s Thirteenth Sabbath Project. See the back of this magazine for details on how you can help to reach this spiritually needy area of Brazil.